The economy of India is the tenth-largest in the world by nominal GDP and the third-largest by purchasing power parity (PPP). The country is one of the G-20 major economies, a member of BRICS and a developing economy that is among the top 20 global traders according to the WTO. India was the 19th-largest merchandise and the 6th largest services exporter in the world in 2013; it imported a total of $616.7 billion worth of merchandise and services in 2013, as the 12th-largest merchandise and 7th largest services importer.India's economic growth slowed to 4.7% for the 2013–14 fiscal year, in contrast to higher economic growth rates in 2000s. IMF projects India's GDP to grow at 5.4% over 2014-15.Agriculture sector is the largest employer in India's economy but contributes a declining share of its GDP (13.7% in 2012-13). Its manufacturing industry has held a constant share of its economic contribution, while the rapidly growing part of the economy has been its services sector - which includes software and information technologies, construction, telecom, infrastructure, health care, travel, trade, tourism, education, banking and others components of its economy. Since 1991, the Indian economy has pursued free market liberalization, considerable exposure in trade and increase investment in infrastructure. This helped the Indian economy to attain a rapid rate of economic growth and economic development. Although, the economy still faces various problems and challenges. The contemporary Indian macroeconomic scene is a paradox. Consider the following facts: fiscal deficit of center and states together in 2001-02 at 9.9% of GDP is higher than its level of 9.4% in the crisis year of 1991. If we add the deficit of the non-financial public sector enterprises to the conventional fiscal deficit, the overall deficit would be even higher now as a proportion of GDP than in 1990-91. The revised estimates for 2002-03 suggest a gross fiscal deficit of 5.9% for the central government. The budget estimate for 2003-04 is only marginally lower at 5.4%. On the other hand, our current account has turned into surplus, and foreign exchange reserves crossed the $80 billion mark at the end of May 2003. Stocks of rice and wheat at the beginning of January 2003 with the government, at 48 million metric tons, was about three times what would be required for the operational and buffer stock needs . It appears that commercial banks are holding more government securities than they are required to hold. Despite a serious drought, inflation is not an issue, and interest rates are falling. Taken together, these facts are paradoxical for a developing country such as India and suggest a rather unhealthy state of affairs. India is still not a very attractive destination for foreign investment. 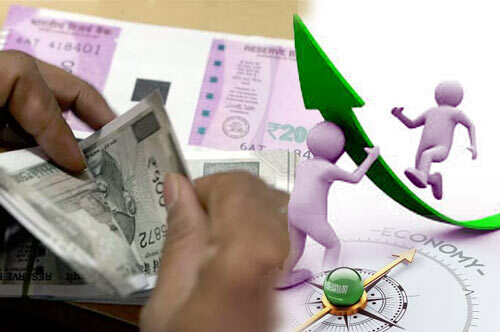 In a developing country such as India, with abundant labour and scarce capital, it would be normal to expect the rates of return to investment to be higher than in capital abundant industrialized countries. As long as risks and frustrations in investing in India do not lower the risk-adjusted rate of return too much, one would expect to see a healthy flow of foreign capital (portfolio, as well as FDI) to raise our investment rate much above our domestic savings rate. The Tenth Plan clearly recognizes the necessity of attracting foreign capital in achieving the target rate of growth. The N. K. Singh Committee report on FDI is very timely from this perspective. Frankly, the mindset of some of our politicians, academics, policymakers, and bureaucrats is yet to change fully from an attitude of hostility to one of welcome to foreign investment, and it continues to be a deterrent. It is no mystery then that FDI inflows to India ($3.4 billion in 2001) are less than what the much smaller economy of Thailand received ($3.8 billion in 2001), even after going through a severe financial and exchange rate crisis. Of course, China received ($44.2 billion in 2001) several times the flow of FDI than India. India's most determined indirect tax reform would substitute existing state and central levies with a uniform tax, enhancing revenue collection while clipping business transaction costs. A Reserve Bank of India panel in January proposed prime changes including making a committee responsible for monetary policy and targeting consumer price inflation, and not the RBI Governor alone. The government should concentrate on selling its holdings in state-run firms that could raise much-needed revenues to reduce India's ballooning fiscal deficit and boost economic growth. The government needs to explore how it subsidizes basic commodities if it is to contain the fiscal deficit and ignore a ratings downgrade. Subsidies cost an estimated 2.2 per cent of India's GDP in 2013-14. The government will need to help state-run lenders battling rising bad loans caused by the slowing economy, rising interest rates and project delays. Stressed loans in India - either bad or restructured - total $100 billion (Rs.6 lakh crore), or about 10 per cent of all loans.